Nireaha Tamaki was born at Te Pakawau on the Manawatu River probably between 1835 and 1837. His father was Matiu Tamaki, a descendant of high rank of Rangitane and Hamua; Nireaha was sometimes known as Nireaha Matiu. His mother, Maraea Te Hungatai, also known as Reikura, was a woman of rank descended from both Kahungunu and Rangitane. Nireaha’s principal hapu were Hamua and Ngati Mutuahi, and he was also kin to Ngati Kapakapa, Ngati Te Wananga, Ngati Matangiuru and Ngati Mawhai. As a small child Nireaha was brought up for a time by Reihana Takawa, who gave him the name Te Morehu. When he was older the Rangitane chief of Puehutai on the upper Manawatu River, Te Hirawanu Kaimokopuna, took an interest in him, ensuring that he learnt about the mana of his ancestors. When Te Hirawanu died Nireaha was regarded as his heir, with responsibilities towards his many hapu. The elders arranged Nireaha’s marriage to a high-ranking woman of Hamua and Muaupoko; this was Rihipeti. Their children were Matewai and Pirihira. Nireaha had several other marriages or liaisons and a large family. At different times in his life he lived at Palmerston North, Tahoraiti (near Dannevirke), Masterton, Ngawapurua (near Woodville) and Te Hawera (Hamua). Nireaha Tamaki began his life’s work as the protector of his people’s land interests in 1871, despite being initially disadvantaged by his relative youth and junior rank. He participated in the sale of the so-called Forty Mile Bush (the Wairarapa end of the Seventy Mile Bush), but aimed to retain substantial reserves for his various hapu at Pahiatua, Ngawapurua, Te Hawera and Tutaekara. In spite of being among the sellers of the 62,000-acre Mangatainoka or Manawatu–Wairarapa No 3 block in Forty Mile Bush in 1873, Nireaha retained interests in several of its subdivisions and reserves, and after a lifetime of land dealings he still owned an estimated 5,000 acres. 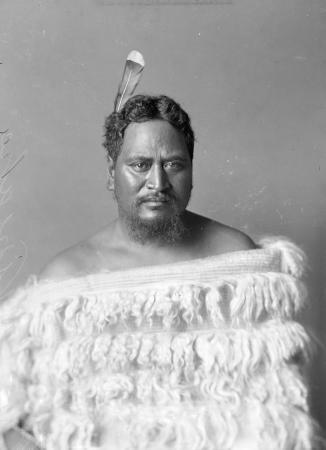 In the 1870s Nireaha began a series of court battles with the western chiefs of Rangitane; he was often allied with Huru Te Hiaro of Te Hawera, nephew of Te Hirawanu Kaimokopuna. In 1872 his claim to be registered as a grantee of the Mangatainoka No 2A or Tutaekara block was dismissed. In 1875 he tried again to have his name inserted as a grantee, saying that he had not agreed to Hoani Meihana Te Rangiotu’s allocation of subdivisions of the block to various hapu. His application was denied by the court. Later, he applied on behalf of himself and his party for a separate grant of the southern portion of the block, since his cultivations and the burial places of his ancestors were there. Te Rangiotu and Te Peeti Te Aweawe objected, and again the application was denied. After the estimated 66,390 acres of Mangatainoka had passed through the court, the Crown offered to purchase the land. For a whole day Nireaha, on behalf of Ngati Mutuahi, disputed rights to the block with Te Rangiotu, who was forced to postpone negotiations to sell. In June 1875 Nireaha wrote to Donald McLean, then native minister, demanding a rehearing of his claim. He wrote again in July, threatening to resort to arms if a rehearing was not granted. McLean seems to have succeeded in resolving the issue at a meeting with Nireaha shortly afterwards. Nireaha was amenable to European settlement despite his battles to retain land. Europeans knew him by the nickname ‘Bulls-tail’. With Huru Te Hiaro he ran the ferry over the Manawatu River east of the gorge. In August 1877 he reached an agreement with the Crown that permitted the river to be bridged, and in recognition of his services he was paid a subsidy of £25 per annum. In 1885 he was painted by Gottfried Lindauer, dressed in a thrummed cloak, carrying a mere, with a huia feather in his hair. By the early 1880s Nireaha’s fights were against the government. After it put a pre-emptive restriction on the Mangatainoka blocks for the purposes of railway construction, in January 1884 Nireaha wrote demanding that the restriction be removed, and that compensation be paid for his improvements. He wanted the government to provide three stations for the Forty Mile Bush area, called Hawera, Pahiatua and Ngawapurua. Government land purchase agents did all they could to buy individual grantees’ shares of the various Mangatainoka blocks, disregarding the wish of the chiefs to retain them as a tribal estate. By January 1884 the government had succeeded in purchasing 41,430 acres. The principal chiefs, including Nireaha, insisted that further substantial reserves be made, amounting to five or six per cent of the total, or between 3,000 and 4,000 acres. In January 1885 Nireaha was visited by Hori Ropiha, who had returned from a visit to England determined to convince the Hawke’s Bay and Wairarapa Maori to cease land selling and to boycott the Native Land Court. As a counter-measure to Ropiha’s influence the government’s agent, Thomas McDonnell, attempted to bribe the non-sellers of the Mangatainoka block, including Nireaha, with a higher price per acre. In April 1885 the government, wishing to sell the portion of its share of the block not needed for the railway, called the case before the Native Land Court. Nireaha’s withdrawal from the court forced it to adjourn to Otaki in late May. In May 1887 Nireaha still retained his shares in Tutaekara, and was making matters difficult for Waata Tohu and other land sellers. In March 1888 he wrote to the minister for native affairs, Edwin Mitchelson, complaining about errors in the surveyor’s plan of Te Hawera, and asking for a rehearing. He was in danger of losing all his cultivations and improvements to the Crown, and the survey line had been approved in the Land Court during his absence at a funeral. In 1890 Nireaha succeeded in getting the Crown proclamation removed from his various blocks so that he could lease them. But his victory was tempered by the Crown’s demand that the owners pay for the survey. Nireaha pointed out that the surveys, hearings and purchases were all government initiatives. The Crown’s agents decided that it was only fair that non-sellers should pay costs on the land they retained: they thought that some European prospective purchaser was trying to avoid paying the costs of survey, and were reluctant to believe that Nireaha genuinely wanted to retain his land. Nireaha’s difficulties with the Crown and its surveys reached their height in 1893 over the Mangatainoka subdivisions. No survey had been made at the time of the original grants, thus invalidating the grantees’ certificate of title. 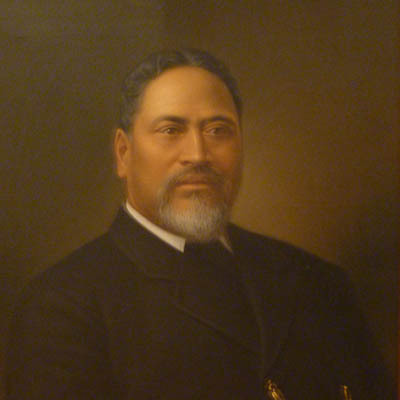 The frequently cited legal case, Nireaha Tamaki v. Baker, was heard before the Court of Appeal in 1894. Nireaha claimed an area of 5,184 acres, either as part of the block granted to himself and others in September 1871, or, if that title was invalid, as land which had never passed the Native Land Court, and was therefore held under customary Maori title. The court decided that Nireaha’s title, if any, was based on customary tenure, and that by a precedent set in 1877 in Wi Parata v. The bishop of Wellington & the attorney-general, the Crown’s transactions with Maori for land held under customary tenure were acts of state, and could not be reviewed by any court, including the Court of Appeal. Moreover, there did not exist any body of customary law known as ‘the Ancient Custom and Usage of the Maori People’ even though that phrase had been used in the Native Rights Act 1865. Nireaha was ordered to pay the costs of the hearing. Nireaha’s defeat was discussed in the Kotahitanga newspaper, Huia Tangata Kotahi. It was claimed that the Court of Appeal had refused to make a decision in his case because if it did, other sales to the government could be questioned on the same grounds. The attention of Maori was focused on Nireaha, especially after he decided to appeal to the Privy Council. The appeal was heard in May 1900, and judgement handed down in May 1901. The decision was reversed, the Court of Appeal being adjudged to have jurisdiction over the question of whether the land in dispute had been ceded to the Crown. The respondent, Surveyor General John Holland Baker, was ordered to pay the costs of the 1894 hearing. In the long run, Nireaha’s victory established several important principles which affected many subsequent cases: the courts would take cognisance of Maori custom, although no customary right could be enforced until confirmed by statute; Maori customary title was not inconsistent with the fact that the fee simple of the whole territory of New Zealand was vested in the Crown; and, most importantly, a system of customary Maori land tenure did exist and should be recognised in court decisions. In response to the Privy Council’s decision, the government passed legislation which limited Maori rights to scrutinise the Crown’s land-purchasing procedure through the courts. Nevertheless, the theoretical considerations at least remained on record, and this in itself made the decision of lasting importance. Nireaha’s success in land matters ensured him a position in Maori leadership. He had played a minor role in the early years of the Kotahitanga movement, and a more prominent one later at the parliament held at Papawai, and in the Maori councils. He became advisory counsellor of the Rongokako Maori Council in 1906. In the early 1900s he built a meeting house, Te Poari, at Hamua for its meetings. He was a haka leader in Ngati Kahungunu performances at Rotorua during the welcome to the duke and duchess of Cornwall and of York in 1901. The same year, he accompanied Tamahau Mahupuku to the Sydney pageant celebrating the inauguration of the Commonwealth of Australia. Nireaha succeeded in getting the name Hamua given to the post office at Te Hawera, which effectively changed the town’s name and commemorated his major hapu. The township of Nireaha, first established in 1886 on land he had sold, was called after him. In 1907 he was elected a member of the Komiti o Tupai of the Tane-nui-a-rangi committee, responsible for the collection and vetting of Rangitane and Ngati Kahungunu genealogy and tradition. Nireaha had been an Anglican in early life, but became a convert to Catholicism in the 1890s. In 1896 he donated land at Hamua for a hall, and later gave more for a church. He died on 3 July 1911 at Hamua. When the day for his burial arrived, he was carried from his house, Te Mihi-ki-a-te-Kuini, to the cemetery. The Catholic bishop of Wellington performed the ceremonies and the sermon was preached by an Anglican minister, Hekiera Te Raro. The funeral was attended by 3,000 Maori and Pakeha. 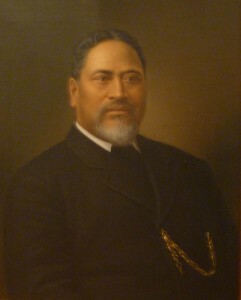 A monument in his memory was erected by his daughters, Meri Ngawhiro and Pirihira Tatere.